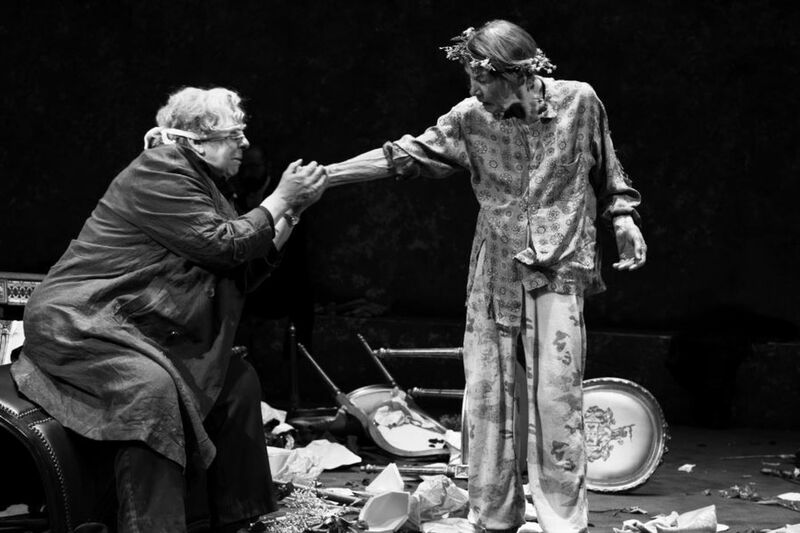 Jayne Houdyshell (left) and Glenda Jackson in "King Lear," through July 7 at the Cort Theatre in New York. Lear’s terrible mistake, made in the first five minutes of this long and tremendous play, sets tragic wheels in motion that no regret, no belated insight can undo. Glenda Jackson gives a magnificent performance as Shakespeare’s prideful patriarch. Directed by Sam Gold, the sensibility of this production seems to incline toward the contemporary. Gold relishes iconic texts replayed, as in A Doll’s House, Part 2, but that taste for addressing the classic with the contemporary is more to the point here, as it was in last year’s Othello, set in an American army barracks. This new production of King Lear insists on gender blindness: Lear as played by Jackson is not a mother in disguise but rather a father whose gender tyranny over his daughters is paid in kind. Glenda Jackson (center), John Douglas Thompson (left), and the cast of "King Lear," through July 7 at the Cort Theatre in New York. This is not just a family drama, but a political drama as well, with obvious contemporary reverberations. The set (designed by Miriam Buether) is deliberately vulgarly opulent, and it will eventually be destroyed by a literal and figurative storm. If there is any political hope to be found in Shakespeare’s tragedies, it is that after the wreckage and the corpses, there are a few good people remaining to rule. The familiar plot begins when Lear, deciding that it’s time to retire, plans to divide his kingdom among his three daughters. He requires each to declare their love for him, rewarding these fulsome declarations by matching the size of their portion to the extravagance of their claims. The vile and violent sisters, Goneril (Elizabeth Marvel) with her nasty sexual appetite and Regan (Aisling O’Sullivan) with her perpetual fierce frown, perform for him as commanded. But the youngest daughter, Cordelia (Ruth Wilson), beautiful in perpetual black, refuses, like a sulky teenager, to participate in this greed game and is consequently cut out of the will. In a delectably theatrical moment, Jackson gives us the line “This shall not be revoked,” with a sensational rolling of that r.
It is emotionally purposeful to cast Ruth Wilson as both the loyal Fool and Cordelia. As the Fool does a kind of Charlie Chaplin turn (although the Cockney accent is sometimes hard to follow), we wonder that Lear doesn’t recognize her. Ruth Wilson in "King Lear," through July 7 at the Cort Theatre in New York. A parallel plot develops as the Earl of Gloucester (Jayne Houdyshell) mistakes the moral quality of his two sons: the vicious, scheming Edmond (Pedro Pascal) and the modest, generous Edgar (Sean Carvajal), who will become Poor Tom, pretending to be a homeless madman after he is exiled. When the Duke of Cornwall (Russell Harvard), Regan’s husband, blinds Gloucester — a terrifically gruesome scene — his literal blindness mirrors his emotional blindness. We wonder that he doesn’t recognize his son’s voice. The two old, pitiful, and mistaken fathers wander the world. Several elements of the prodouction distract us from the devastation of that world, by adding distractingly fascinating sign language (the Duke of Cornwall is deaf). But more irritating is the onstage string quartet in formal concert clothes playing original music by Philip Glass; this annoyingly cues each emotional high point, and, worse, competes with the speaking voices. This is especially egregious during Lear’s scene in the storm on the heath, when we want to hear Jackson, not Glass. With her powerful, deep voice enduring to Lear’s very end, Jackson seems to grow frailer and tinier, showing us as well as telling us the tragedy. Through July 7 at the Cort Theatre, 138 W. 48th St., New York.